More months ago than I care to admit, a nice young fellow sent me, just out of the blue, a book he’d written. The book was Your Wildest Dreams, Within Reason and the nice young author was a former Rockvillian, Mike Sacks. Growing up in the All-America City, Mike says he noted my byline in various publications and thought I might be a kindred spirit in the écriture drôle business. And so I am! 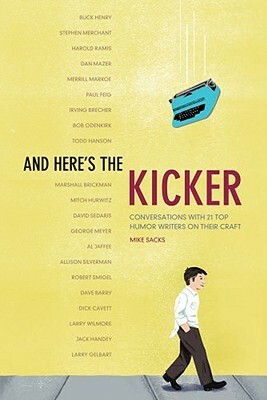 And it also turns out that I already owned a Mike Sacks book, the unexpected but wildly entertaining/educational And Here’s the Kicker: Conversations with Top Humor Writers About Their Craft, which contains so much comedy gold, including an interview with then-nonagenarian Irving Brecher, who wrote for the Marx Brothers. (!) (I grabbed the extra interviews that didn’t make the hard copy from McSweeneys. You should, too.) Fortunately for us all, Mike is working on a second volume. Read his recent interview with the reclusive humor genius Henry Beard here. Of course, Mike was not merely being nice in sending the book. He also was, politely, interested in securing my review. I was flattered and eager to help. But wasn’t it Bismark who said, “First, kill all the eager ones”? A truism, because my help turned out less than helpful. My pitch to the Washington Post — local boy makes good, writes book containing items of local interest — was turned down with a curt reply that they don’t do “those” kind of books. That is, collections of funny stories. Sigh. And there was no love from Washington City Paper, either. The Potomac Patch managed to smile on Mike. Sigh, sigh. So, I said I’d put the review on my own damn site. And, finally, finally, finally, here it is. Well, there’s another reason to get a Kindle! Turns out, I had read some of the stories from Wildest Dreams on McSweeney’s. And I laughed a second time, which is the benchmark of quality jokewriting. Many other pieces were originally published in the New Yorker, Esquire, and Vanity Fair, where Sacks works. As I noted quite a while ago, print-based, word-rich literate humor writing is a continuing casualty of our mod-a-go-go digitized, Instagrammed world. Which is why it’s both a delight and surprise that young Sacks bothers with the form, and succeeds so well. 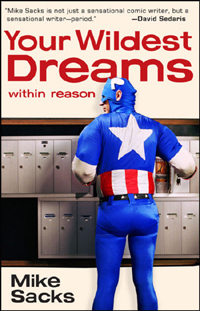 Wildest Dreams sustains a consistent tone and Sacks has a keen eye for the droll and absurd. Just reading the story titles, it’s not hard to imagine they come from an updated Robert Benchley book: “Rules For My Cuddle Party,” “Dr. Margaret MacLeod: Daydream Tutor,” “A Few Things I’ve Discovered About Teenagers.” Especially amusing is a running series featuring clueless aspiring author Rhon Penny (the H is silent), who pesters famous authors in hopes of collaborating with them. Just high-minded idiocy throughout. Sacks notes in his intro that the stories are not linked in any way. But in fact what links them all is Sacks’ affection for his hometown, Rockville, USA. Wildest Dreams is riddled with references to this area. The dedication page name-checks Poolesville and on page 25 we find “Starbucks in the Congressional strip mall, Rockville, Maryland.” Another tale takes us to the intersection of Falls and River Roads. I stopped counting there are so many. How many will you spot? Some of the local color is routine, others are part of the gag, as in the story “Shaft in the Suburbs,” subtitled “Groove Time in Potomac, Maryland.” Yes, the concept of plunking the super-funky Shaft into a tame cul de sac is solid in and of itself. But us locals get an extra charge out of the piece because we know exactly how Potomac is the perfectly wrong place for anything super-funky. Likewise, reading the word “Hammerjacks” provokes a special frisson hereabouts. Q: Do you find yourself using D.C. references because of an intrinsic humor value or to amuse yourself? MIKE: I think it’s mostly to amuse myself. Growing up, I could never find books that took place in the D.C. suburbs. There were plenty of stories about silly cats living in the White House, or society mysteries that took place in Georgetown, but nothing really outside of that—beyond boring political nonsense. And it’s fun to write about locations where I once dreamed about writing books. Plus, even though I’ve lived in New York for 10 years now, I still think of myself as a Washingtonian—especially this time of year, around Spring. Q: There seems to be a renaissance (though, perhaps not a Renaissance) of humor books. Many people (me) point to the ’20s, ’30s, and ’40s, when Robert Benchley, SJ Perelman, and James Thurber were cranking out the comic prose, or the 1970s, when Woody Allen had a great run, as the heyday of funny books. Until recently, a walk through the “Humor” section of any non-bankrupt bookstore revealed mostly collections of cartoons and sad volumes from the Jokes for the Bathroom series. Why so many laughable books now? And/or, is this true? And what are your thoughts on Benchley, et. al.? Could Perelman get published today, what with his thesaurus-quality vocabulary? MIKE: There does seem to be a tremendous surge in popularity of writing humor books, which I find odd, as there’s very little money in it. It seems that a lot of stand-ups want to write books, for whatever reason. Perhaps it’s a sense that they’ve made the big time. Or, perhaps, publishers and agents encourage comics to write these books. With that said, I don’t think the quality of most of these books is top-notch. There are some that are good, but I’m not too impressed with most of them. It seems that they’re produced very quickly, read very quickly, and then forgotten very quickly. I like Benchley a lot, more so than Perelman, who I always thought was trying too hard. I think Woody Allen’s recent work wants to be Perelmen-esque, and I’m not a fan of it. Ideas can be complicated, but I don’t think the language has to be; and, in fact, a fancy style can often take away from the strength of a joke. With that said, I can see why Perelman’s work is popular and has lasted. It’s polished to a high gleam. He put a tremendous amount of care into the work. But if anything, I prefer the scripts he wrote for the Marx Brothers to his written work. Could Perelman be published today? Not if he didn’t have his own HBO stand-up special. I think marketing counts for more today than talent. Q: And how did you come to be so productive in this field? You seem to have a day job that should take up most of your time. Or does it? MIKE: I just work [at writing] everyday and try not to take any days off. And I enjoy it. If I didn’t, I wouldn’t do it. I’d find an excuse to not do it. I work here in the editorial department of Vanity Fair. I can’t really write at work, but I do work on writing in the mornings and at nights. It’s a pleasurable distraction. And it is amazing how much one can accomplish by not watching five hours of TV a night (I only watch four).